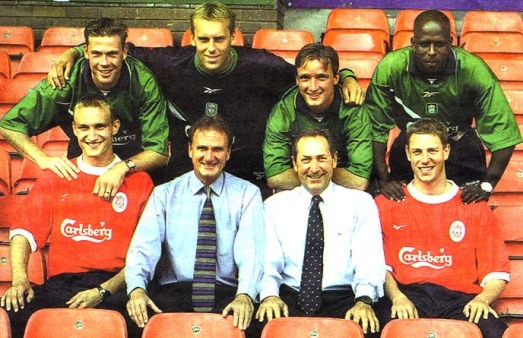 Seven arrive in the summer of 1999 - LFChistory - Stats galore for Liverpool FC! Houllier's first full season was ahead and big changes were predicted. He wanted a brand new pair in central defence, an attacking midfielder who could create a lot of chances, defensive midfielder who could shield the defence, a towering goalkeeper and one skilful and the other a big target man, in the forward line. Titi Camara - 37 games and 10 goals. "When he first came, the first three or four months, we all thought what have we got here – Pele? Everytime you gave him the ball he was flicking it over someone's head or scoring some great goals. Unfortunately it went a bit pear shaped for him towards the end." - Jamie Carragher. Stephane Henchoz - 205 games. "He had a tough start when he came because he was injured for a few months but once he started playing every week he was a tremendous player. He was as tough as any I've seen. He never lost a tackle or a challenge. He didn't look the strongest but he was a very strong boy. I think him and Sami were just an awesome partnership for five or six years." - Dietmar Hamann. "Everyone talks about foreign players like Zola, Henry and Bergkamp but they never look at Sami. In terms of consistency he's well up there with them, there's no doubt about it. Maybe he can do something out of the blue every now and again but every week, for nine months of the season, Sami Hyypia is your man. He's definitely one of the best foreign players this country has ever seen." - Jamie Carragher. Erik Meijer - 27 games and 2 goals. "He was just a great fella to have around the place and a great fella to have on the pitch when he did play – a real team player who'd really put himself about. He was just unfortunate at the time that we had so many good strikers. Mad Erik, I think he's definitely a cult-hero. "- Jamie Carragher. Vladimir Smicer - 184 games and 19 goals. "The highest point was obviously winning five winners' medals in 2001. That was a great season for us. My biggest regret is my injuries. I had a difficult start and it seemed every time I was finding some form I was injured. I know not everyone liked me as a player, but I had a lot of supporters and good friends here and I just wish I hadn't suffered so many injuries because then I could have shown more consistency. I feel my best games came when I played in a more central position where I could get involved more. I was never a winger." - Smicer in May 2005. Sander Westerveld - 103 games. The double arrival of Dudek and Kirkland put Sander up in the stands. 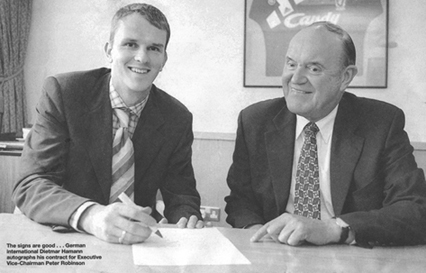 "When I returned from international duty last week Houllier told me that I was the No3 keeper at the club. He said I was still allowed to train with the first team but I would be sitting in the stands on Saturday. I'm absolutely disgusted with that. There's no use staying at Liverpool as long as Gerard Houllier is there." Dietmar Hamann - 283 games and 11 goals. An excellent defensive midfielder whose consistent performances earned him rave reviews. Der Kaiser was a very popular guy amongst the players and the supporters the seven years he stayed at Liverpool. Have a look at our Transfer database which includes transfers from Liverpool's first season to this day!